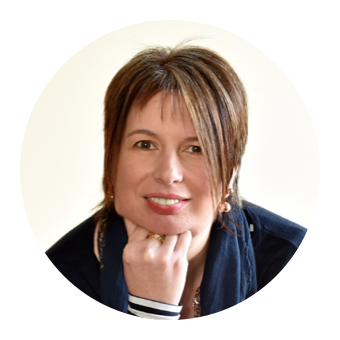 Apologies for the radio silence on the blog. I've been off gallivanting in Singapore. The idea was that rather than schedule posts for when I was away I'd keep up my blogging from overseas, but best laid plans and all that meant it simply didn't happen. I had the most amazing time in Singapore and felt very privileged to be there as they celebrated their 50th Anniversary as an independent nation. One of the main things I was excited about for my trip was the food. For me travel and food absolutely goes hand in hand. 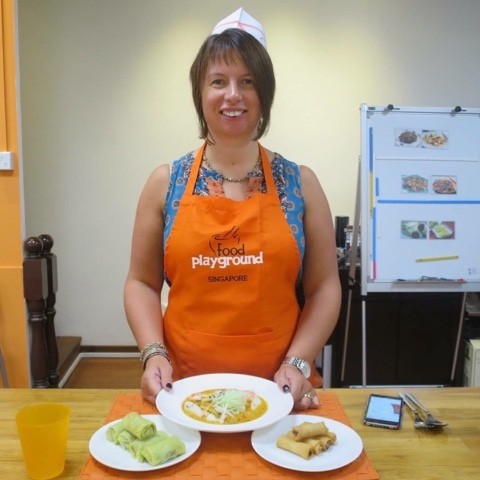 I did a wee bit of research online to track down a cookery class to attend and signed up for a morning at Food Playground. Located in a heritage shophouse in Chinatown cooking at Food Playground provided a brilliant cultural introduction for my first full day in Singapore. The class for the morning was small but perfectly formed. Emily and Marie from Australia and me from Scotland. We started by learning useful snippets about Singapore’s food culture and heritage and how food has played such a huge part in bringing together a multi-racial society. 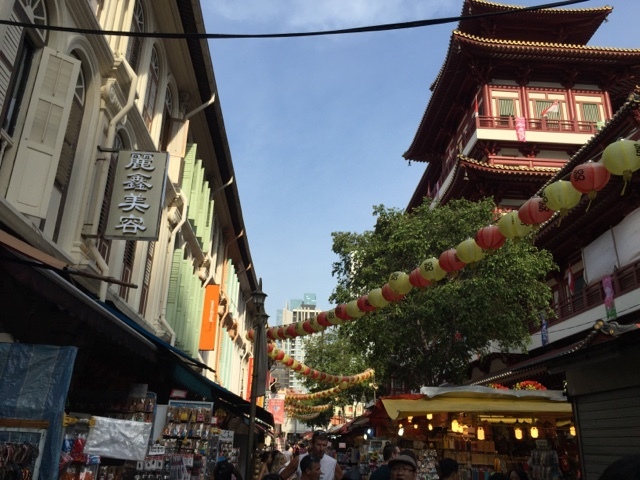 Our tutor Lesley explained all about the local street food and hawker centre culture and gave us top tips on how to reserve a seat with a packet of tissues or a whole table with an umbrella. 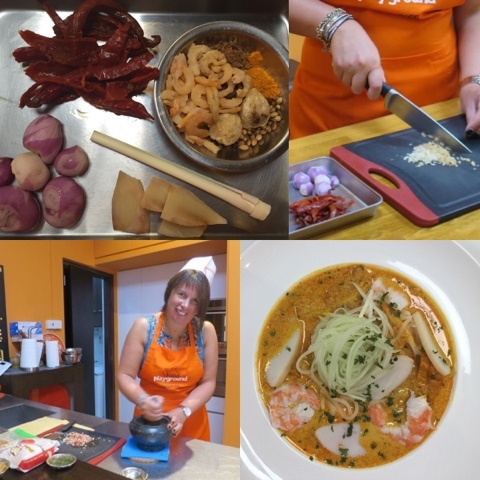 She shared her knowledge and expertise about what typical Singaporean foods we should try during our stay and which markets and particular dishes to look out for. There is no such thing as the western dish "Singapore Noodles". 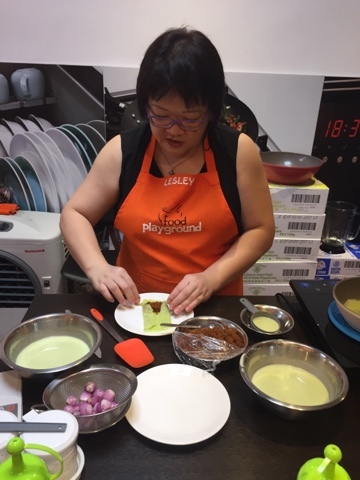 Time to get hands on and start the cooking with Lesley leading and Auntie (Singaporean term of affection and respect for an OAP) keeping on top of the prep and clean up operation. 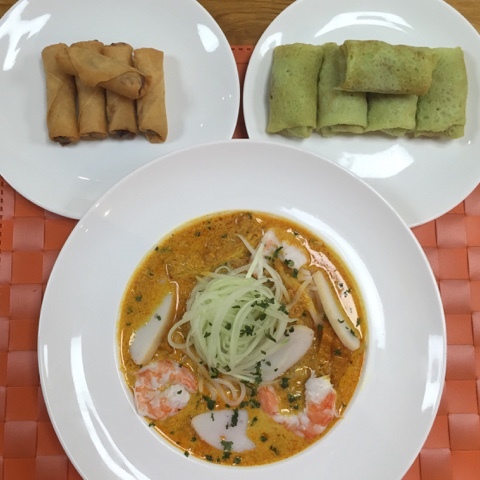 Our menu for the day was - Nyonya Laksa (Peranakan style curry based noodles), Deep Fried Spring Rolls and Kueh Dadar – (Pandan coconut crepe with palm sugar coconut filling) First we had to make our laksa paste. No grinding allowed with the pestle & mortar. 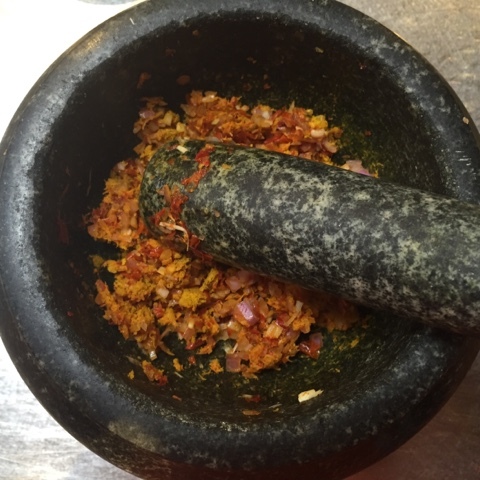 Only pounding to turn chilli, candlenuts, shallots, gangal (Asian ginger), shrimps and spices into a smooth paste. A great workout for the arm muscles. This was fried off and combined with prawn stock and coconut milk to make an aromatic broth. Salt and sugar to season before it was poured over laksa noodles and topped with prawns, sliced fish cake, tau pok (tofu puff) and shredded cucumber. 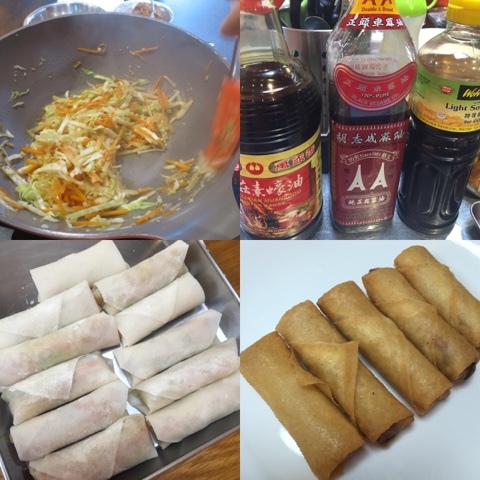 For the spring rolls we made a filling from finely shredded carrots, turnip (yam bean) and cabbage. This was fried in sesame oil and seasoned with garlic, sugar, soy and oyster sauce. The mixture was left to drain before we made our rolls using ready made spring roll skins. A wee bit fiddly to begin with and important to make sure they are tight and there are no bursts. 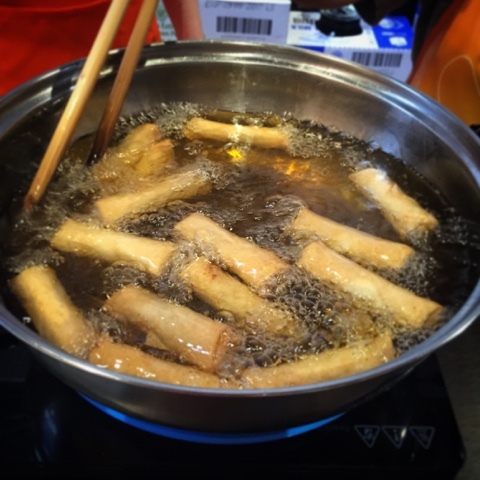 A cornflower and water mixture was used to seal the rolls before they were deep fried in a wok until golden brown. 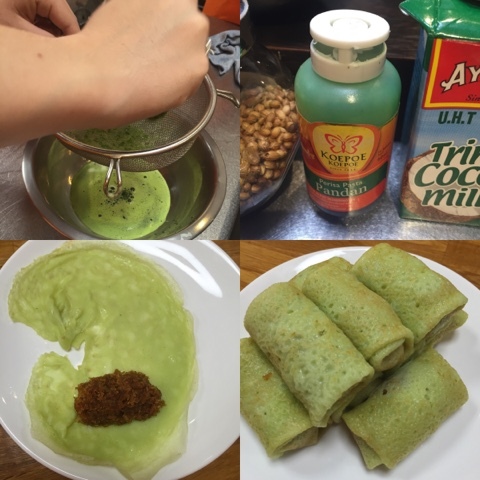 Last dish was Kueh Dadar – pandan pancakes with a coconut filling. These are bright green crepes with the colour coming from the juice of pandan leaves. The flavour of pandan is reminiscent to vanilla and the batter is made with egg, flour and coconut milk. The filling is an irresistible sticky brown mixture of coconut and palm sugar. The tricky bit was trying to get each roll the same shape and size. Time to sit down and enjoy the fruits of our labour. All three dishes looked and tasted fantastic but the laska was probably my favourite. I'm definitely going to try and recreate them all at home although I may have to substitute some ingredients if I can't track them all down in the UK. The recipes arrived by email following the class along with a link to an album of photos on the Food Playground Facebook Page. 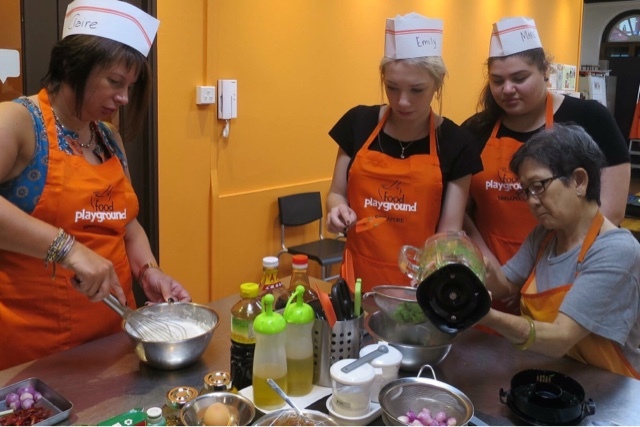 The social mission behind Food Playground is to create meaningful and dignified employment opportunities for seniors and stay-home mothers by hiring them as cooking instructors and helpers. By doing this, we effectively help them monetize their knowledge and passion in cooking for sustainable income and better social engagement which is becoming increasingly relevant given our rapidly ageing population and challenges in getting mothers back into the workforce. Great to read about your overseas adventures, how lucky to be able to join that class... Love the look of those green pancakes! The pancakes are indeed very Fanny. Welcome back - it looks like you had a great time. I love South East Asian food. Look forward to hearing more. It was a case of so much food, so little time. Despite that I've come back with a food baby in my belly! Oh wow how exciting. I would love to go to Singapore. The food looks amazing! I was really excited about going and the reality was even better than my expectations. Wait, Singapore Noodles aren't real? This does not compute! A completely made up product for the western palate it would appear. Ooh what a super fun thing to do on holiday and a great way to pick up a bit of the culture too. I adore Laksa, although my vegetarian version is nothing like this one of course. The great thing about Food Playground was that if you gave them notice they could also adapt for vegetarian, gluten free an other diets. It was the perfect foodie introduction to a fantastic trip. Indeed it was, tasty too!